Following the announcement of the 2019 courses for the 7-day events and Haute Route Asheville in December, course details for two more 2019 Haute Route events were revealed today; both the Haute Route Alpe d’Huez (July 12-14) and Haute Route Ventoux (October 4-6) present several new features whilst remaining true to the routes that have made the events so popular amongst Haute Route riders. 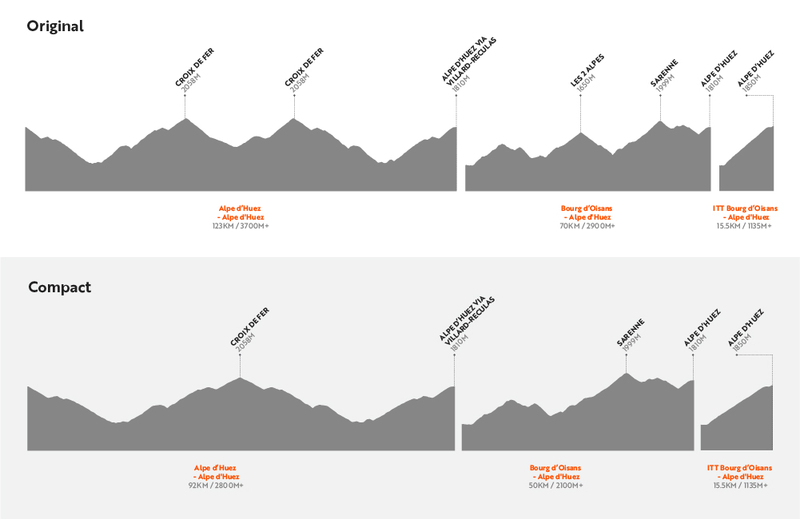 New in 2019, both events also offer riders the opportunity to choose between the Original or Compact course, with the Compact courses featuring fewer kilometres and less climbing than the more demanding Original courses. True to the Haute Route promise, participants will be privy to a true “ride like a pro” experience throughout each event. From extensive security measures out on the road, including race vehicles, Mavic neutral support, medical support and rolling road closures; to unrivalled off-the-bike services such as massages, meals, briefings and much more, riders are sure to make the most of their weekends and enjoy memorable experiences in the process. Returning for a third edition, highlights of the 2019 Haute Route Alpe d’Huez course include a double ascent of the Col de la Croix de Fer on stage one, three different ascents to Alpe d’Huez and an uphill time trial on the famous 21 bends. Also returning for its third edition, highlights of the Haute Route Ventoux course include the three ascents of Mont Ventoux, a sunrise climb through the Gorges de la Nesque and empty roads snaking through the vineyards and quaint towns of Provence. Event profiles and descriptions for each event can be found below. Taking place in the heart of the French Alps, the Haute Route Alpe d’Huez has rapidly become one of the best opportunities to tick off a host of bucket-list climbs in just a few days. Above and beyond the infamous 21-bends, riders will get to take on the Col de Sarenne, Les 2 Alpes and both sides of the Col de la Croix de Fer. Leaving from the resort of Alpe d’Huez, the start of the first stage will take riders downhill into the Oisans Valley towards the Col de la Croix Fer. This demanding three-part ascent to 2058m will present the perfect introduction to the weekend before riders descend back into the valley, turn around and head straight back up to the summit to conquer both sides of this emblematic mountain in the space of the just a couple hours. To reach the finish line riders will then have to take on the ascent of Alpe d’Huez via Villard-Reculas, a longer but easier climb than the 21-bends. Riders taking part in the Compact will only ascend the Croix de Fer once on this stage, before climbing back to Alpe d’Huez via Villard Reculas. 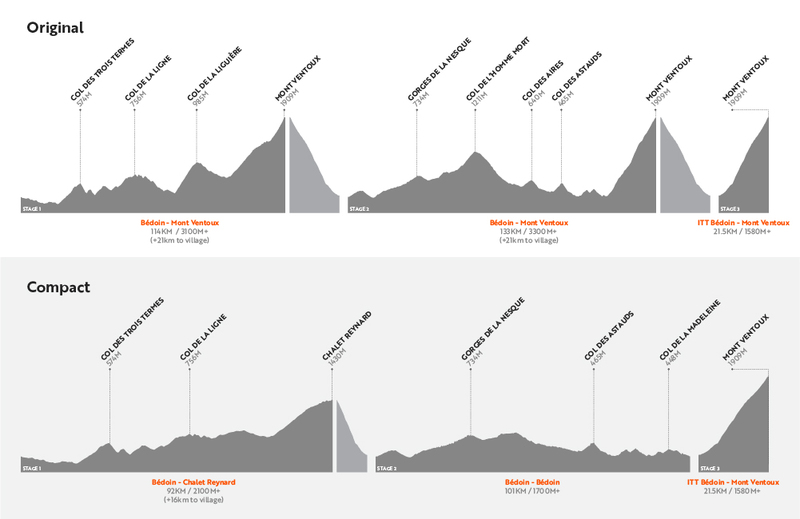 Starting this time in the valley from the heart of Bourg d’Oisans, the second stage of the 2019 Haute Route Alpe d’Huez features an uncategorised climb to the town of La Garde before heading along the Balcon d’Auris towards the ascent of Les 2 Alpes. Returning to the valley after a brief visit to the resort of Les 2 Alpes, the peloton will ride across the Chambon Dam with its turquoise waters before taking on the challenging ascent to the Col de Sarenne. The first slopes of this climb are the toughest before reaching the town of Mizoen where the gradient becomes slightly shallower and the narrow mountain road winds its way across the front of the mountain to reach the summit at 1999m. Descending into the town of Alpe d’Huez riders will get a brief glimpse of the finish line before reaching the foot of the final ascent of the day up the final six bends of Alpe d’Huez. The Compact route on this second stage bypasses the ascent to Les 2 Alpes and takes riders straight from the Balcon d’Auris into the foot of the Col de Sarenne. The third and final stage features an uphill time trial on the most famous climb in cycling – the 21 bends of Alpe d’Huez. Heading down the ramp one by one in Bourg d’Oisans, riders will take on the 15.5km climb in an individual effort against the clock. Climbing 1135M through 21 bends, the ascent can be broken down into several sections. Firstly, the steepest section from the start of the climb to the town of La Garde, next a slightly easier section through the town of La Garde and into the following succession of switchbacks and lastly the final bends through the town of Alpe d’Huez, past the Palais des Sports before turning left at the roundabout to reach the official Tour finish line. Closing out the European season of Haute Route events, the third edition of the Haute Route Ventoux presents a great opportunity to finish your summer of riding in style atop one of the most recognisable mountains in cycling. Towering over the flatlands of French Provence, each of the three stages will finish at the summit of Mont Ventoux. The first stage of the Haute Route Ventoux gets off to a relatively easy start, featuring a long false flat downhill into the first small climb of the weekend up the Col des Trois Termes. This climb has become a classic of the Haute Route Ventoux, featuring a constant gradient and a winding road to the summit. Some rolling hills ensue from the descent before a short climb over the Col de la Ligne followed by the longer ascent up the Col de la Liguière to take riders towards Sault and the foot of the mighty Mont Ventoux. Starting from Sault, the first climb up Mont Ventoux is the easiest side of the mountain as it features an initial 19km with slopes between 3-4% before reaching Chalet Reynard and the final assault on the summit above the tree line. The Compact route on this first stage will feature the Col des Trois Termes and Col de la Ligne before heading straight into the Ventoux and finishing at Chalet Reynard. Starting once again from Bédoin the second stage of the Haute Route Ventoux is now synonymous with a sunrise ascent through the exquisite Gorges de la Nesque, riders will want to look up from their handlebars to appreciate the breath-taking views and autumnal colours reflecting in the sun’s rays as they make their way up the first climb of the day. Cresting the summit only a short descent ensues before taking on the more challenging ascent of the Col de l’Homme Mort which rises to 1211m above sea-level. Two more short climbs then stand in the way over the Col des Aires and Col des Astauds before heading into the foot of Mont Ventoux in Malaucène. Arguably the toughest side of Mont Ventoux, the ascent from Malaucène features a long portion of 3km which never drops below 11% gradient, and it will present a stern challenge for the peloton as riders make their way to the summit of the bald mountain for the second time in two days. For the second stage the Compact route will avoid the Col de l’Homme Mort and Col des Aires, and head back to Bédoin via the Col de la Madeleine. Unchanged from previous years, the third and final stage of the Haute Route Ventoux will be an uphill time trial from Bédoin to the summit of Mont Ventoux. Heading down he start ramp one-by-one, the riders will complete the Haute Route Ventoux with an individual effort against one of the most famous climbs in all of cycling. The ascent can be split into three distinct sections. Firstly, a rolling start towards Saint-Estève, secondly a winding and steep road through the forest to Chalet Reynard, and finally the last 6km above the tree line through the emblematic barren landscape of Mont Ventoux. Reaching the summit at 1909m above sea-level, riders will have conquered all three sides of the mountain throughout the weekend and will become proud finishers of the Haute Route Ventoux.